Traveling for business, I was afraid I was going to miss Pi Day. But as one of my jokester friends pointed out on Facebook, the thing about Pi Day is it goes on forever. (Ba-dum-tsssh.) 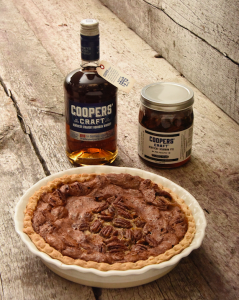 So I wanted to share this new product from Brown-Forman’s Coopers’ Craft Kentucky Straight Bourbon Whiskey and Louisville Stoneware that makes baking a bourbon pecan pie pretty darned easy (and even easier if you use a prepared pie crust). Coopers’ Craft Kentucky Bourbon Pie Filling, which contains Coopers’ Craft and pecans, is packaged in a glass jar. You just mix the filling with eggs and butter, pour it into a pie crust and bake. (I’m told the filling is also good just poured over ice cream straight out of the jar, but that doesn’t count as “pie,” even by my lax standards.) Coopers’ Craft, introduced last year as the first new Brown-Forman product in 20 years, is a mild 82.2 proof that’s good for baking. Its name reflects Brown-Forman’s more than 70 years of making barrels as the only major distiller to own a cooperage. The Bourbon Pie Filling ($15.99) is a collaboration between Coopers’ Craft and Louisville Stoneware. It’s available at the Louisville Stoneware store at 731 Brent St. in Louisville and at stoneware.com. You can also purchase a themed stoneware pie plate for $42.